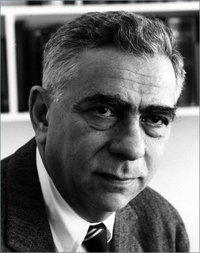 Emanuel Piore was Vice President and Chief Scientist, International Business Machines (IBM) (1965-1972). Other institutional affiliations included the United States Navy. His research interests included electronics; thermionic, photoelectris and seconday emission; composite surfaces; and metallic and solid states. July 19, 1908Birth, Vilnius (Lithuania). 1930Obtained BA, University of Wisconsin, Madison, Madison (Wis.). 1935Obtained PhD in Physics, University of Wisconsin, Madison, Madison (Wis.). 1935 – 1938Physicist, Electronic Research Laboratory, RCA Research Laboratories, Radio Corporation of America. 1938 – 1942Engineer-in-Charge, Television Laboratory, Columbia Broadcasting System. 1942 – 1948Senior Physicist, Bureau of Ships (1942-1944); Officer, Office of the Chief of Naval Operations (1944-1946); Head, Electronics Branch, Office of Naval Research (1946-1947); and Director, Physical Sciences Division, Office of Naval Research (1947-1948), United States Navy. 1948 – 1949Director, Research Laboratory of Electronics, Massachusetts Institute of Technology (MIT). 1949 – 1954Deputy Director, Natural Sciences (1949-1951) and Chief Scientist (1951-1954), Office of Naval Research, United States Navy, Arlington (Va.). 1955 – 1956Vice President and Director of Research, Avco Manufacturing Corporation. 1956 – 1964Member, Board of Trustees, Woods Hole Oceanographic Institute. 1956 – 1965Member, Naval Research Advisory Committee, United States Navy. 1956 – 1972Director of Research (1956-1961); Vice President, Research and Engineering (1960-1963); Member, Board of Directors (1962-1973); Vice President and Group Executive (1963-1965); and Vice President and Chief Scientist (1965-1972), International Business Machines (IBM), Yorktown Heights (N.Y.). 1959 – 1962Member, President's Science Advisory Committee (PSAC). 1961 – 1972Member, National Science Board. 1963Member, National Academy of Sciences. May 9, 2000Death, New York (N.Y.). Both worked on President's Science Advisory Committee (PSAC). Both employed by President's Science Advisory Committee. Vice President and Director of Research. Director of Research; Vice President, Research and Engineering; Vice President and Group Executive; Vice President and Chief Scientist; and Member, Board of Trustees. Physicist, Electronic Research Laboratory, RCA Research Laboratories. Senior Physicist, Bureau of Ships; Officer, Office of the Chief of Naval Operations; and Member, Naval Research Advisory Committee. Head, Electronics Branch; Director, Physical Sciences Division; Deputy Director, Natural Sciences; and Chief Scientist. Obtained BA (1930) and PhD (1935). Development of science policy since World War II [sound recording] / 1976. Emanuel Ruben Piore papers, circa 1918-1986. Oral history interview with Emanuel Ruben Piore, 1977 March 7. Science and engineering in a free society [sound recording] : A panel discussion presenting three points of view, 1960 September 29. Sessions from 5th annual meeting of Corporate Associates [sound recording], 1962 September. The character of federally supported research in universities [sound recording] : a panel discussion, 1969 September 29. The effectiveness of scientific advice to government [sound recording] : a lecture series at the University of California, Santa Barbara / 1976. Oral history interview with David Lazarus, 1981 December 4. Oral history interview with Joseph Weber, 1983 April 8. Oral history interview with Ralph Gomory, 2010 July 19. President's Science Advisory Committee records, 1957-1961. Wayne Treber Sproull response to early 1930s Ph.D.s Survey, 1980. Science and academic life in transition / Emanuel Piore ; edited, with an introduction by Eli Ginzberg.